When I first heard about the premise for developer Pinokl Games title Party Hard, I was skeptical as going to a party to kill everyone seemed like a PR disaster and unwarranted. Fortunately, I can honestly say I was wrong in my presumptions and Part Hard happens to be one of the more refreshing tactical/stealth games I’ve played on the Nintendo Switch. Part Hard’s story involves an troubled protagonist hell-bent on shutting down obnoxious parties that are ruining the peace and quiet he has become accustomed to. Instead of doing the normal thing of calling the police to deal with the issue, you are tasked with killing everyone at the party using stealth, a knife, and randomized environmental hazards, all while avoiding the cops that come on the scene. You will be traveling across the country and the narrative is deliberately silly with hilarious voice actors trying to sound serious and featuring self-deprecating humor throughout. Between missions, cut-scenes vaguely detail the missions you’ll embark upon and are the main motive for traveling across the country to perform various acts of violence. The story is definitely tongue-and-cheek and is not the highlight of Party Hard, but it does the job in pushing the narrative forward. Gameplay-wise, your character is simple to control, but there are some puzzling gameplay mechanics. You have to try and commit the crimes without being spotted by party-goers, and to do this you can wait until someone is alone or make the deaths of the party-goers look like an accident. If using stealth is your preferred method, you’ll want to be sure to hide any bodies in various trash bins, sewer covers, etc. There are many different ways to accomplish your goal, by pushing them off a building, onto a barbecue pit, or have them run over by an apparent runaway golf cart. One of the great features of Party Hard are the interactions with the environment. This is always randomized, so even if you replay levels the experience won’t be exactly the same. You can even herd partiers to their doom by showing off your less-than-stellar dance moves. If you slip up the cops are called and you’re arrested and you’ll have to replay the level from the very beginning. When playing Party Hard, you’ll learn that patience is a virtue and knowing when to strike is vital. The 8-bit graphics and dance-enthused soundtrack mesh well with the setting and keep Party Hard from getting too serious. The visuals reminded me of Hotline Miami, with a great variety of detail shown with each level. Each character will perform differently, from some couples walking off to find places to… well, get it on, and others will go swimming, grab food, or dance. I really did like the aesthetic of Party Hard and was one of the stronger aspects of the title. Another highlight was the audio, as it really helped give out that party vibe. The sound effects were appropriate to the carnage you could dish out on-screen and exemplified the panic of what it would be like with a psycho killer on the loose. One gripe I had was the learning curve with the games tutorial level having you kill a handful of enemies and then suddenly the next level having you murdering 50-plus people. A more gradual ramp up in scope would have been appreciated, especially to help players new to this type of stealth and strategy. I also wish there were more environmental interactions as it is probably the best part of Party Hard. You can only perform the few hazards per stage a few times before they grow stale. 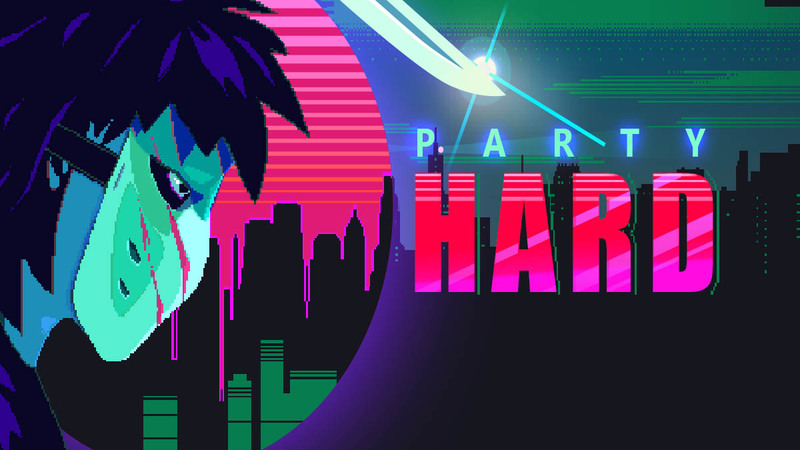 Party Hard is filled with over a dozen levels and even includes some special random events, such as a martian ship appearing and beaming everyone up which in turn kills them all. It’s definitely solid value for the money you’ll be spending and offers plenty of entertainment. Overall, Party Hard has an interesting premise, that’s sometimes bogged down with poor AI implementation and a highly steep learning curve. It is fun and I still recommend it for those looking for something unique, but the potential was definitely not reached in the gameplay and story elements. While it may be unfair and frustrating at times, Party Hard is still a party worth assembling for.